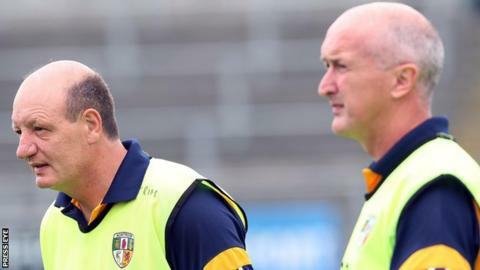 Four former county players are to take charge of the Antrim hurling squad on a short-term basis. Terence McNaughton, Dominic McKinley, Neal Peden and Gary O'Kane have stepped in following the recent resignation of PJ O'Mullan. Their first game will be in the Christy Ring Cup against Kildare on 23 April. "They are stepping in on an interim basis and the situation will be reviewed after the Christy Ring," said a county source. McNaughton, O'Kane and McKinley were all part of the Antrim team which made it to the 1989 All-Ireland final. It means a second spell in charge for McNaughton and McKinley as they were joint managers of the Saffrons between 2007 and 2009. In an effort to accommodate hurling and football fans, Antrim have given up home advantage for the Christy Ring opener against Kildare, in the hope a Dublin venue can be arranged. On the same day Antrim's footballers play Louth in Croke Park in the Division Four final.